It's designed with the brand’s sustainable EvoRose tonewood. 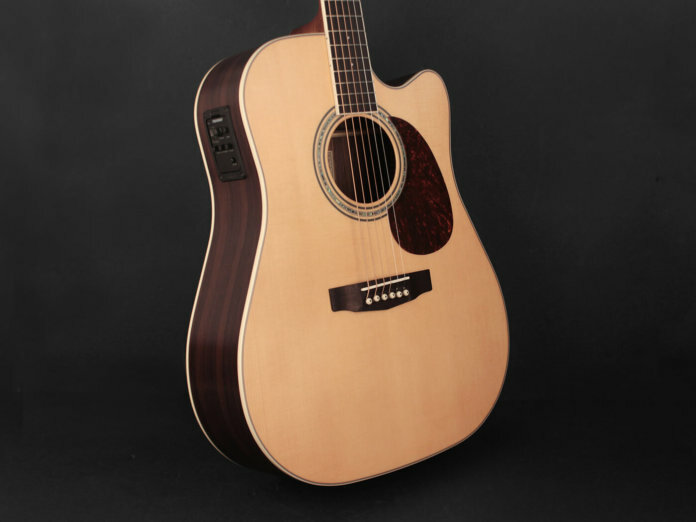 Cort has released the MR720F Acoustic-Electric guitar, a single-cutaway dreadnought that features the Korean brand’s sustainable EvoRose tonewood. According to Cort, EvoRose is a composite material that emulates rosewood’s visual and sonic qualities. The use of EvoRose as a rosewood alternative also abides to the guidelines laid down by CITES, which listed rosewood as a protected species in 2017. EvoRose is employed on the MR720F’s back and sides, and it’s complemented by a solid Sitka spruce top for a rich and natural acoustic tone. Other tonewoods include a mahogany neck, an ovangkol fretboard and an ovangkol bridge. The acoustic also has a Fishman Presys Onboard Preamp System, which comes with a three-band EQ, an LED tuner and a phase button – the perfect tools to craft a live sound. Rounding out the guitar’s classy look is a Venetian cutaway – for easier upper fret access – and vintage-style open-gear tuners. Retails at $599. More information at cortguitars.com.